Situated near Eely Point, Lismore Park and walking distance to town centre, this is Wanaka at its finest. This two-storey home features four bedrooms. The Master bedroom has an ensuite and 3 bedrooms have door opening to the lush garden. The fourth bedroom is a comfortable bedroom/playroom for the kids equipped with DVD player and XBOX to keep them entertained! Open-plan kitchen, dining and living area, which opens out onto balconies that capture the sun. 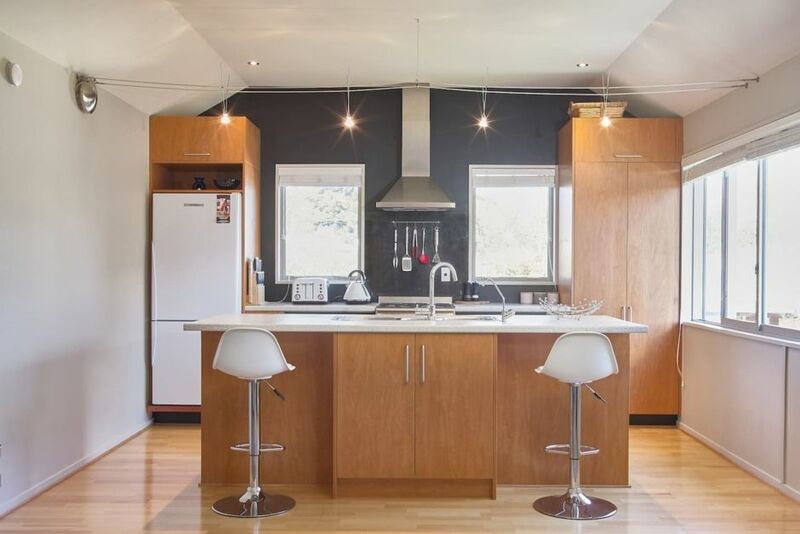 The kitchen is modern with an island, designed for family living and fully equipped. The views are lovely to the mountains with peeks through to the lake. Just a 10 minute bike ride or easy stroll to town around the lake's edge. We enjoyed the stay very much! The house is wonderful, has a spacious, well equipped living room and has a very complete equipment. The House was perfect for our stay. The House was perfect for our stay. Really well laid out, the whole up stairs was basically a huge living area with open plan kitchen so we could all hang out together, also had decks off the living areas which would be ideal in summer!. Bedrooms were good size. Location was great, about a 1-2 minute walk to the lake front which has a walkway all along it. About a 15 minute walk into the Wanaka township along the lake front. Would definitely recommend it to anyone with a large group! Great place in a great location with an easy walk to the lake! Great place in a great location with an easy walk to the lake! Comfortable and spacious even with the extended family and kids! Plenty of space in all the bedrooms.